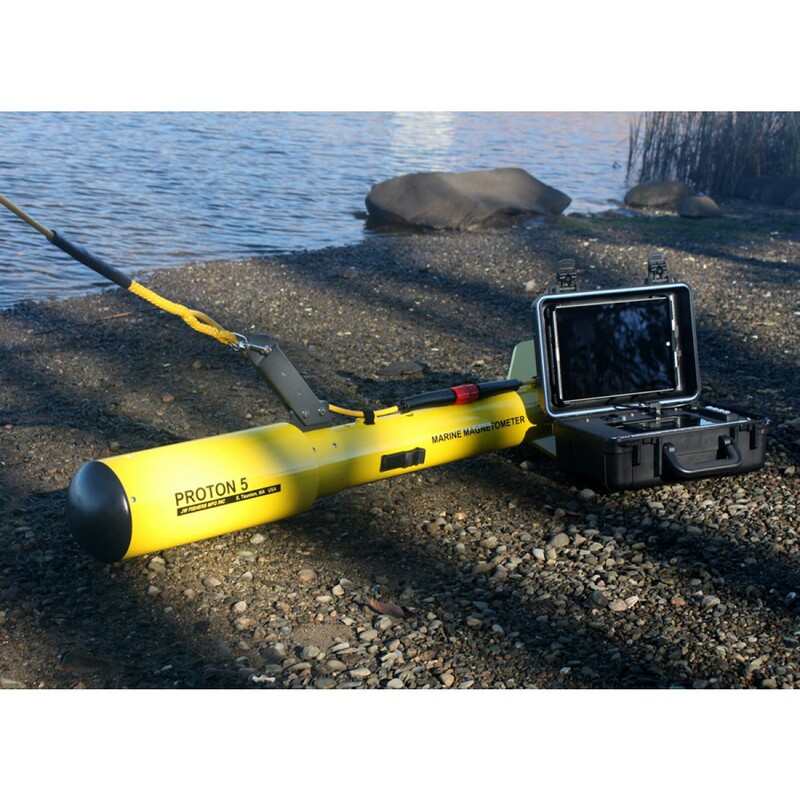 The Most Powerful Boat Towed Metal Detector for Ferrous Metals. 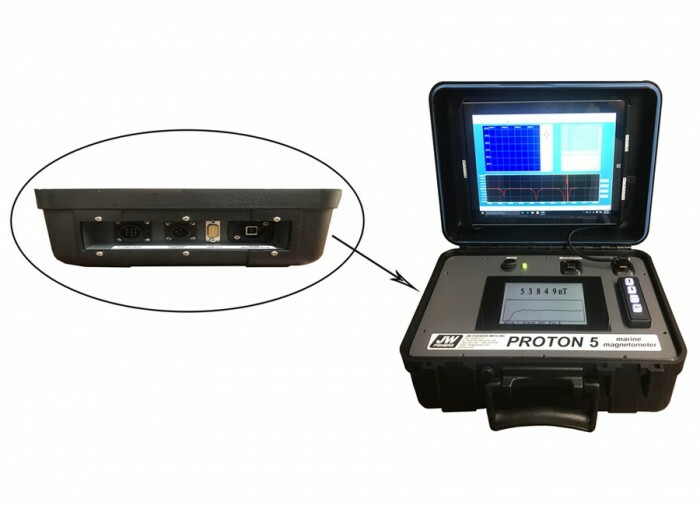 The PROTON 5 is a fifth-generation proton magnetometer from JW Fishers. 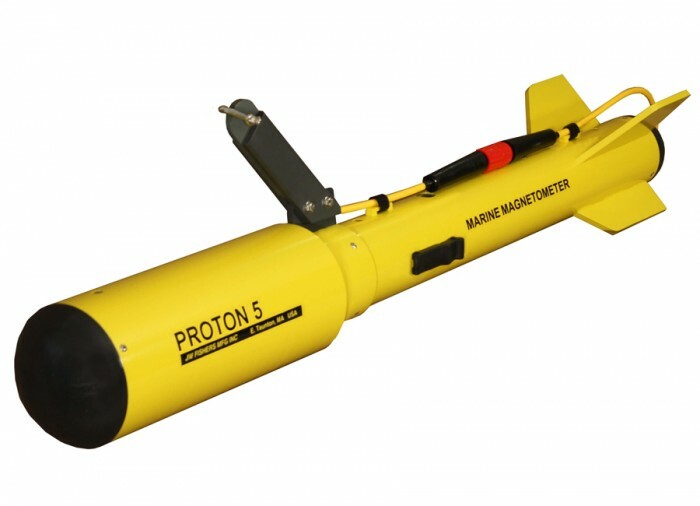 It is a top performing microprocessor driven marine magnetometer detection system. 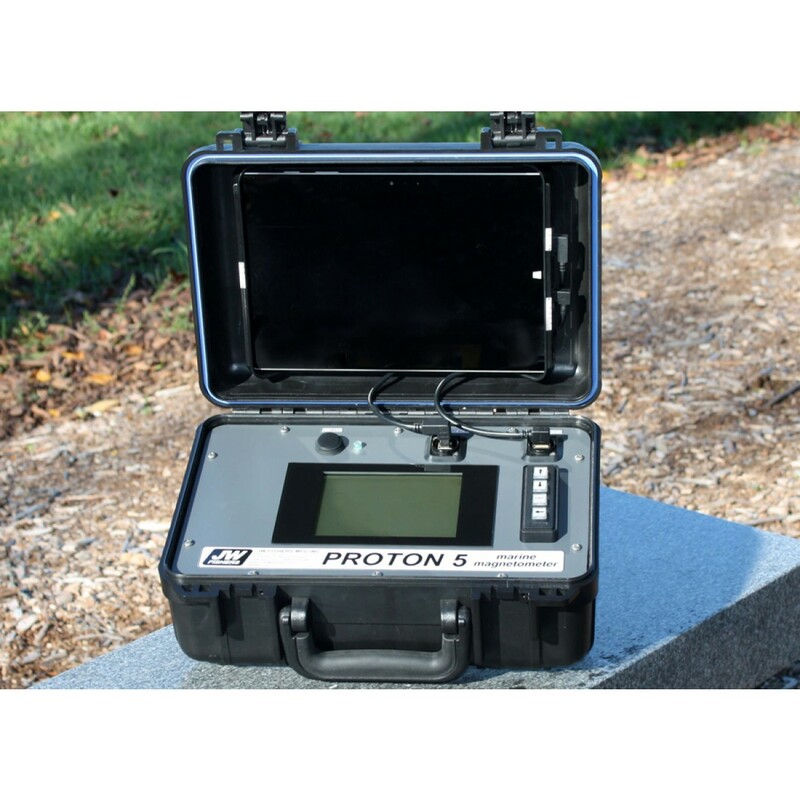 The Proton 5 definitive detector for iron and steel targets. 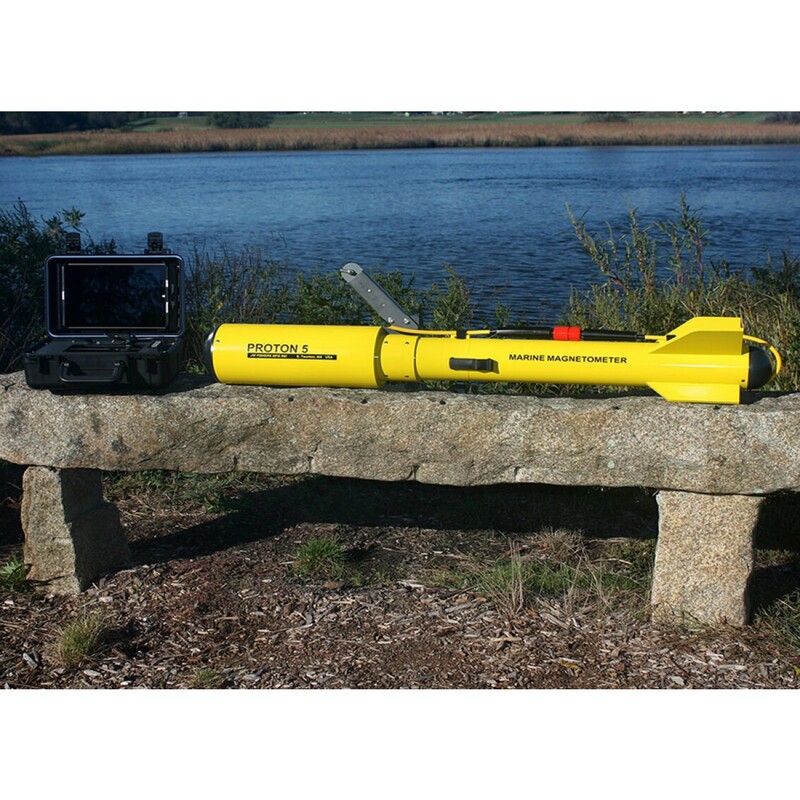 It's maximum range capability of 1,500 feet (450m) on each side (3,000-foot total swath) lets you search a wide area quickly and completely. The mag is also a good choice to locate a variety of smaller targets such as pipelines, anchors, chains, cannons, dredge heads, etc. 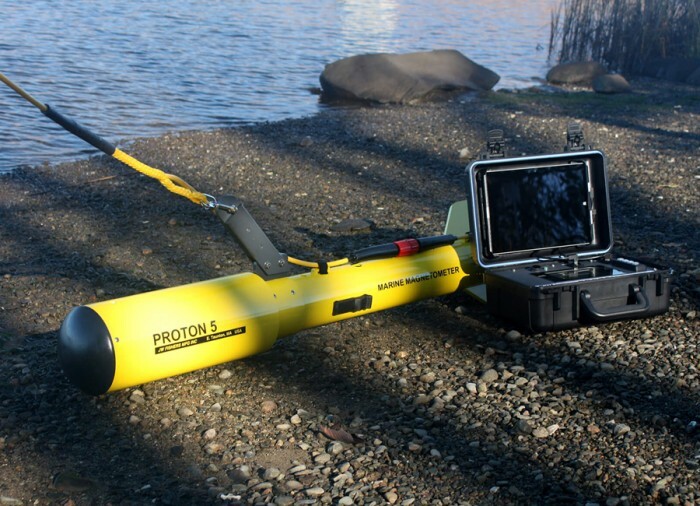 It is especially useful when objects are buried in the bottom and can't be found with sonar or video search systems. 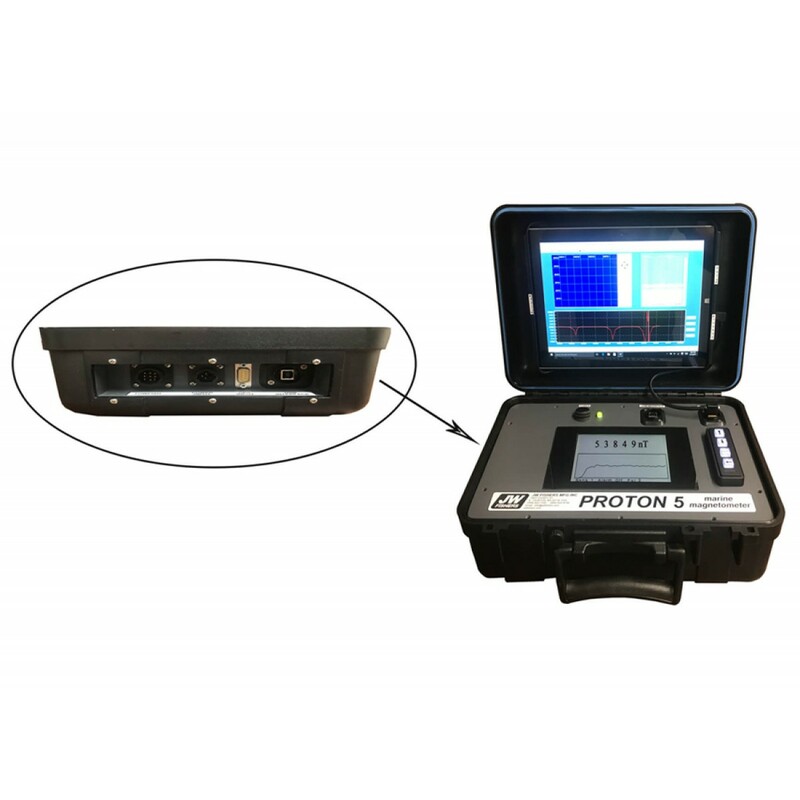 The detection range is unaffected by the medium between the magnetometer and the metal target. Performance does not change whether detecting through air, water, silt, sand, or solid coral. 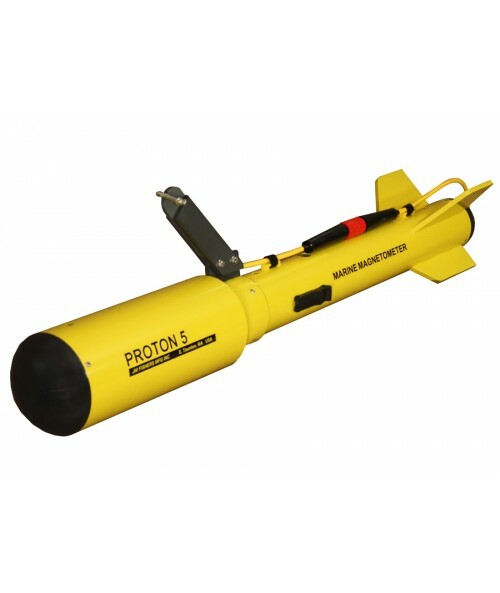 It's extremely large detection area make this magnetometer the ideal choice for both commercial operations and professional wreck hunters. With a one Nano -Tesla (nT) sensitivity, it has the maximum usable sensitivity for a towed proton precession magnetometer. A two second cycle time gives a strong return signal and is fast enough to detect even small iron/steel targets. 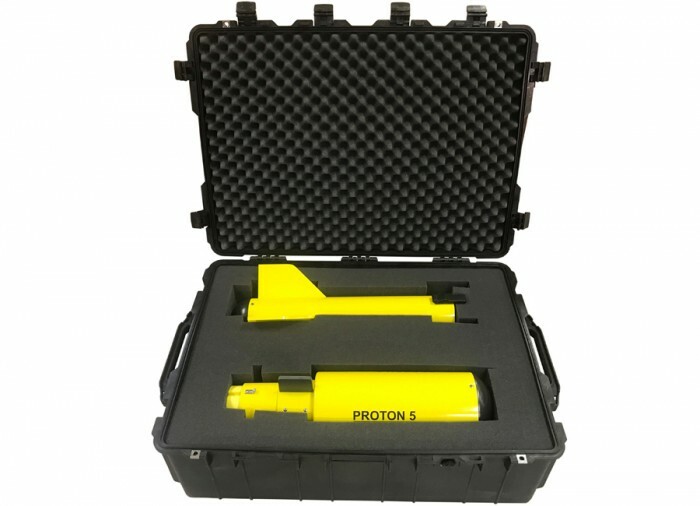 The PROTON 5 features a triaxial noise-cancelling sensor that allows omnidirectional towing without heading error or dead zone. 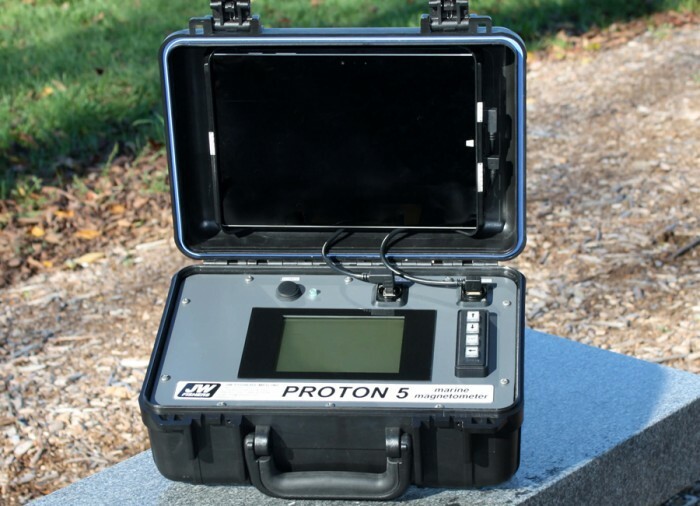 The system is fully digitized and displays the current 5-digit measurement on an easy to read 6-inch LCD screen that is backlit for night operations. Up to 80 of the previous measurements are also displayed graphically in a history plot on the LCD. With the optional altimeter, distance off bottom of the towfish is displayed. User friendly menus allow easy configuration of all operation settings and system tuning directly from the top-side control box. An adjustable audio alarm lets the operator decide how much of a change in the baseline reading will cause the alarm to fire. 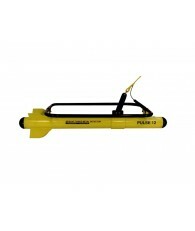 The towfish has excellent hydrodynamic characteristics, moving smoothly through the water at tow speeds up to 10 knots. The Fish can be towed at almost any speed, but should be towed slow to locate small targets or when towing the Fish deep. A 2-3 knot tow speed is recommended for small targets. 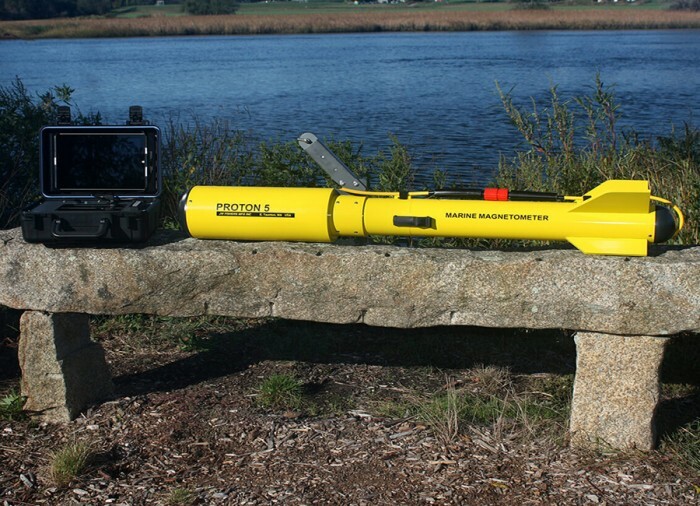 With the optional UA-3 Altimeter, precise distance off the bottom can be maintained. For deep water towing, the Fish is towed behind the optional DDW-1 Deep Dive Wing depressor. 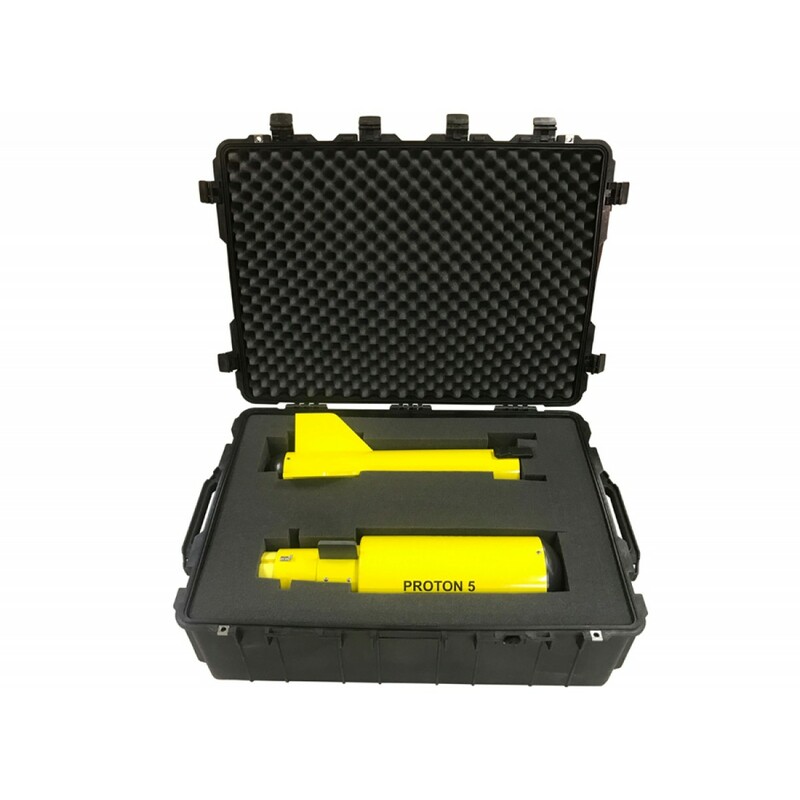 The collapsible PROTON 5 towfish it easily fits into a watertight Pelican® case. Modular construction allows easy field repair, should it ever be necessary. 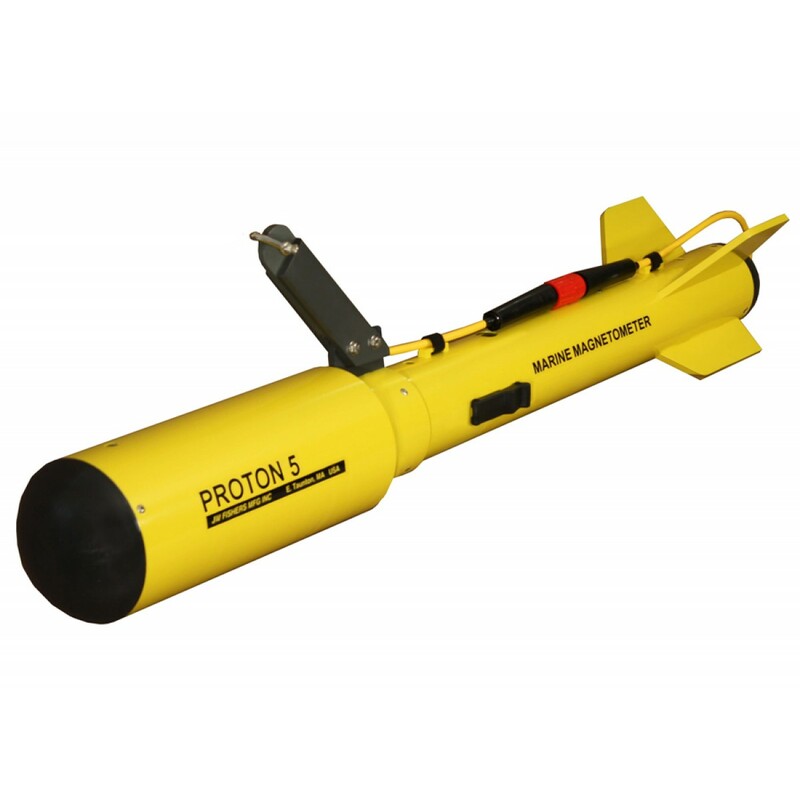 The Proton 4 system includes the towfish, 150 feet of Kevlar reinforced and urethane coated cable providing a strong tow member, and a top-side control unit. The control unit features easy to read LCD display, audio alarm, and variable sensitivity switch (for pinpointing targets). The complete system is powered by two 12 volt batteries with a total power consumption of only 40 watts.